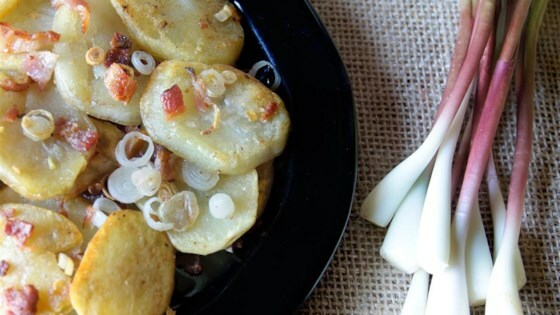 "In the springtime, I always look forward to making ramp potatoes. If you've never had a ramp, you are missing out! A member of the leek family, they have a taste like garlic, onion, and a little something special!" Place potatoes into a large pot and cover with salted water; bring to a boil. Reduce heat to medium-low and simmer until beginning to soften, about 10 minutes; drain. Heat bacon drippings in a large skillet over medium-high heat; cook and stir potatoes in the hot drippings until golden brown, about 15 minutes. Stir ramps and bacon with the potatoes; season with salt and black pepper. Continue cooking until the ramps are soft, about 5 minutes.